The Minister said that Pradhan Mantri Ujjwala Yojana (PMUY), which was launched in May 2016 with a target of 5 crore of deposit free LPG connections, has already covered over 6 crore vulnerable, disadvantaged sections of the society, and it will cover 8 crore by next financial year. The Minister of Petroleum and Natural Gas & Skill Development and Entrepreneurship Dharmendra Pradhan has said that India has emerged as a bright spot in the global economy in the recent years. 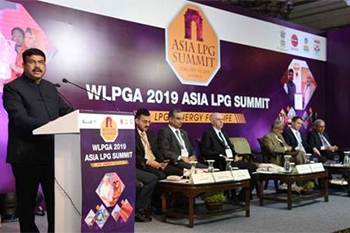 Inaugurating the WLPGA 2019 Asia LPG Summit here today, he said that with strong economy and supportive policy environment, Our Government remains committed to inclusive, holistic and sustainable high economic growth. As a welfare state, we are committed to provide basic necessities of life to the last person standing. Pradhan Mantri Awas Yojana is a programme to provide affordable house to all by 2022, each of which will have toilet, electricity connection, LPG, drinking water, and bank account under the Jan Dhan Yojana. Appreciating the collective efforts of all the stakeholders, Pradhan said that LPG connections are now available to 90% population which was just about 55% in 2014. He said that traditional fuel causes pollution and has health implications. Switching over to LPG has not only empowered women, but has also protected their families from indoor pollution. The Minister said that India has become the second largest importer of LPG. The successful implementation of PMUY has been hailed by various multilateral agencies and developed nations, and has set an example for the developing countries. The scheme has brought Swasthya and Samman, important for Swa-raj. The scheme has catered to the Bottom of the Pyramid. The Minister talked of Ujjwala Panchayats in which 10 million beneficiaries have participated so far, and which focusses on safety, sharing of experiences and provides valuable feedback. He said that the Government has implemented PAHAL, the largest DBT scheme through which one lakh crore rupees have been transferred. Sh Pradhan said that the Prime Minister launched Giveitup, which inspired people to take part wholeheartedly in giving up subsidies, and the savings were used for developmental activities. The Minister talked about extending regional cooperation with neighbouring countries and stressed on collaborative efforts.